Do you feel confident with your pricing? Do you feel your prices are too low, too high or about right? It is so so important to get your prices right – the wrong price could be not only detrimental to your business but totally catastrophic! It is the difference between plenty of clients and none or not enough. It’s the difference between having enough (or more than enough money) and struggling to pay your bills each month. It is the difference between ease, flow and maintaining excitement in your work and feeling stressed, tired, resentful and working too hard. In this blog, I’m going to help you understand why pricing your services is really tricky to do (indeed something we all struggle with), the aspects you need to know about that underpin your pricing decisions and how to price yourself effectively and confidently. For a moment though, let’s take a step back and talk about what pricing has to do with marketing. When you work for yourself and you birth your own business, it is a creation which comes from your heart, soul and hopefully your head too. So many independent business women I meet are great at what they do, but have no clue how to market themselves – why would they when it’s not something they’ve had to learn before! Marketing isn’t just promotion (which is what most people think marketing is). It is actually everything potential customers see of your brand and business; your services/products, your branding, where you promote yourself, how much your charge as well as all your promotion such as email marketing and social media. So, part of marketing is designing and creating your service or product (ie what goes into it, what it is called, what it looks like etc) and deciding how it is positioned in the marketplace. One of the main keys you need to be aware of, to position your brand/service/business, is the PRICE and how it relates to the rest of your competitors. We make such a quick judgement of quality based on the price. Pricing your services is a really tough thing to do and something we all struggle with. I promise. In part because pricing is both an art and a science, so there’s no right or wrong and it certainly isn’t a black or white decision. There is no one way to do it and there’s no magic formula that tells you what to charge. Yes, you can (and should) do your market research and see what others are charging, then the ‘art’ part is carefully positioning yourself based on that data. Secondly, pricing is intricately linked to your value and worth. So to price yourself and your services, means to put a monetary value on yourself and what you do. What a scary and vulnerable thing to do! Most women struggle at times with self-esteem and self-confidence. Your sense of self-worth is related to these, but runs much deeper, so deep that you may not even be consciously aware of it. Thirdly, how can you price something rather intangible (like hypnosis) or something totally unique like the particular way you get someone results with your coaching or commissioned artwork? I often hear from women that one of their biggest fears is not making enough money to be able to stay in their business, while staying authentic and in their integrity. No one with any integrity, wants to rip anyone off! I also really get that you may want to be affordable, BUT you also need to pay your bills and honour (and value) your time, energy and expertise. Any of these, can lead you to not charge enough for what you do. You’ll know you’re not charging enough because you’ll feel the pressure of not earning enough, you’ll try to work harder not smarter (believing only longer hours will equal more money), your client retention is very low, you add so much value (or content) or over-deliver but it doesn’t seem to help bring in more clients. There may be other reasons too of course! You may also feel scared or wobbly at the thought of raising your prices or hear your inner voice say “you can’t charge that! or “no one will pay it”. Now, I’m just not saying that you should raise your prices if any of this resonates, because if you don’t believe in that price, if you can’t confidently say that price, then your potential clients will feel that lack of confidence and it will backfire! We pick up on energies like lack of confidence unconsciously. Finding the right price for your services, means finding the right price for you (one that brings in enough money and feels in integrity) AND the price that is right for your ideal clients (the price they are happy to pay because they can see the value in what you do). If your price is too low for your ideal clients, it will put them off and they won’t pay you! Equally if it is too high, they will go elsewhere. As I’ve said, pricing yourself and your services is not easy and there are many aspects that affect the pricing decisions you make. I actually think setting your prices is not something you should do alone. Getting support by working with an experienced coach and/or facilitated within a group, will really help you to move through any money or self-worth blocks and find the right price for your services. 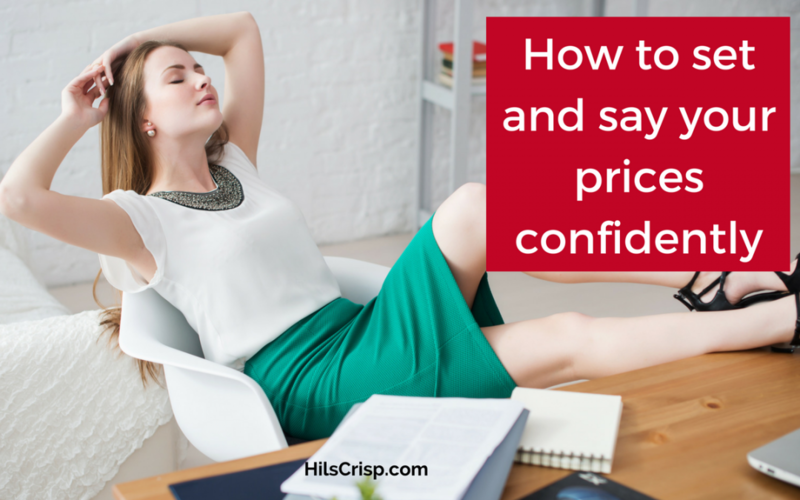 If you need help with confidently setting the right price, saying your prices to potential clients and asking for the sale/payment or charging what you’re really worth, then you are firmly invited to my upcoming workshop: Price Yourself Confidently. It’s happening in Bristol in November – please check out the details here now. I guarantee you won’t regret it and there’s no harm in checking it out! In fact, you could easily make the cost back by implementing what you learn in the workshop.